Creating a résumé or CV can be a tedious task, manually listing your experience, training, and other salient facts of your life. And then it may get ignored by prospective employers or clients who just want to know what you can do. Increasingly, your skill and results are what counts, so having a good way to showcase them is important. Enthuse.me is a free service that lets you do just that. You can quickly put up an Enthuse.me page that pulls in the best of your work from around the Web. Enthuse.me's introductory page is simple and cuts right to the point, just like the service itself. While competitors About.me and Flavors.me emphasize customization, Enthuse.me is all about keeping things simple. To get started, you need to provide only a single profile image, and describe yourself in a couple of words. This forms the basis of your page, but isn't very interesting on its own: Your next step is adding links to your work. 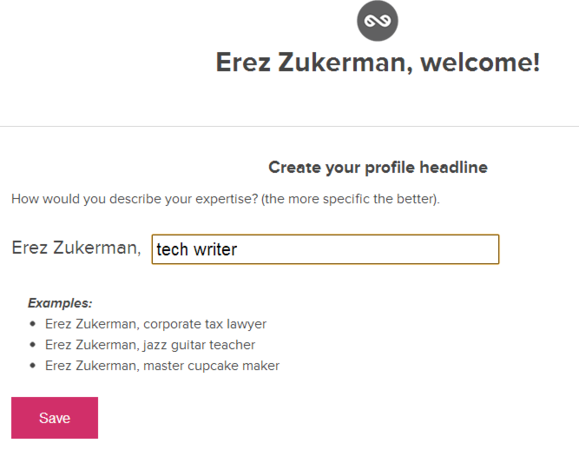 To get started, Enthuse.me asks you to describe yourself in just a few words. 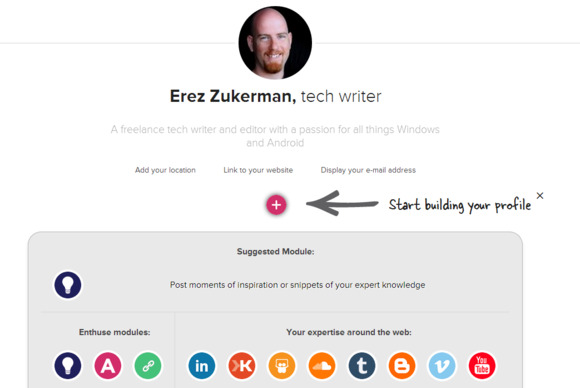 Not all links are equal, and Enthuse.me reflects this by offering different modules for populating the page. There's a module for links showing your current work, and there's one for historical links. 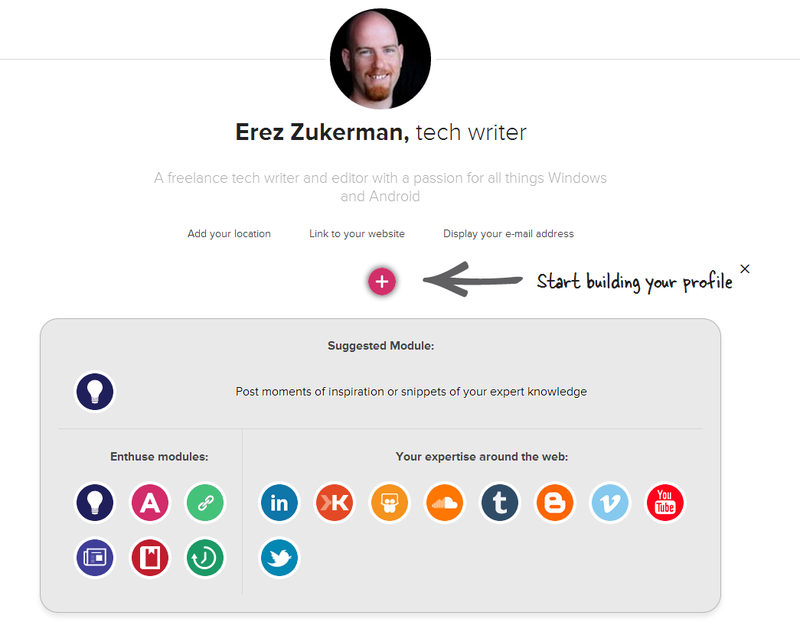 There's a module for your Twitter profile that renders your vital Twitter stats on the page, and there are purpose-built modules for Blogger, LinkedIn, Soundcloud, SlideShare, Tumblr, Vimeo, YouTube, and even Klout, if that's your thing. Finally, if you just want to add a bit of text, the Insight module lets you write a 255-character message that appears right on the page, sort of like a static tweet. You build up your page by adding content modules. The Current Projects module includes a thumbnail, and lets you specify a headline and an excerpt for describing the link. There's also a Press & Mentions module, for including links to places which noted your work in the past. 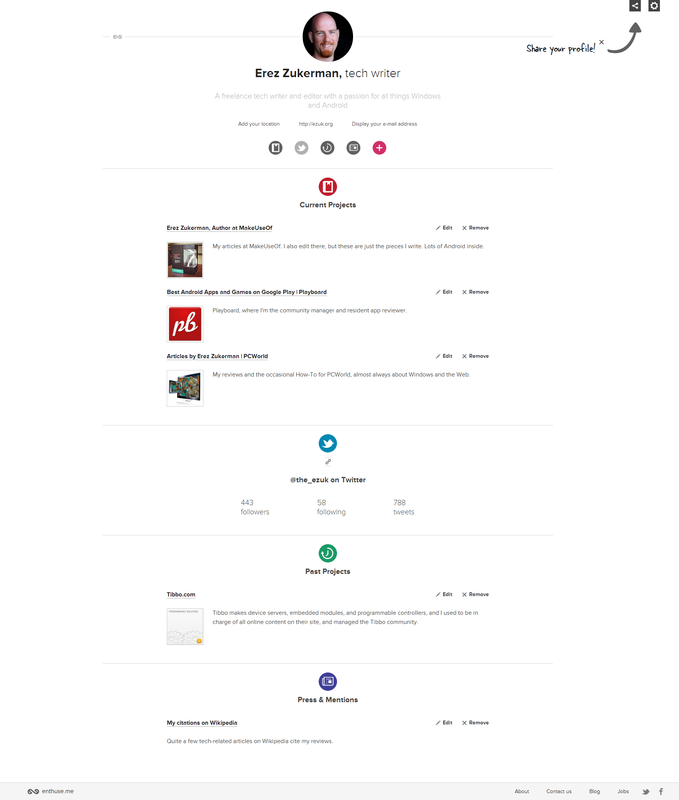 The end result feels like a neat, comprehensive summary of your online professional presence. Since you can't pick a color or a theme, it may not look very different from all other Ethuse.me profiles, but the clean, sparse layout puts your information front and center. The company will introduce customization options later this year, as a premium feature. The final page is clean and spacious, and can house lots of information without becoming visually overwhelming. 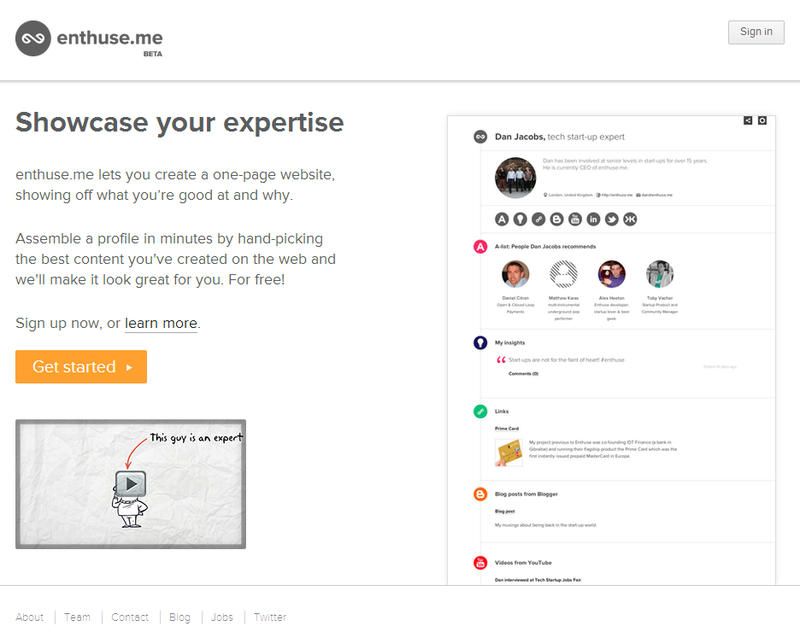 Enthuse.me is a fast and simple way to show the world what you're about. I wouldn't say it's better than using Flavors.me or coding your own site from scratch, but it's definitely faster. If you're looking for a clean online CV, this can be it. If you're looking for a free and super-simple way to show the world what you're good at, Enthuse.me is it.